Giving judgment yesterday in the Patents Court (England and Wales) in Yeda Research and Development Company Ltd v Comptroller General of Patents  EWHC 1733 (Pat), Mr Justice Lewison dismissed Yeda's appeal against the Dr Lawrence Cullen's decision to refuse its application for two SPCs. The facts are a bit complicated. Yeda applied for a cancer treatment patent in 1989 which was granted in 2002 but later expired. This patent taught that two forms of agent were used to kill tumour cells: cytotoxic agents and cytostatic agents (which included monoclonal antibodies). Yeda had found that the combined treatment of one of the novel monoclonal antibodies with anti-neoplastic drugs provided a more efficient treatment for inhibiting the growth of human cancer cells than did the use of the new monoclonal antibody of the anti-neoplastic agent by itself. Claim 1 of the patent was for "A therapeutic composition comprising (a) a monoclonal antibody and (b) an anti-neoplastic agent" and Claim 2 covered "The therapeutic composition of Claim 1 for separate administration of the components". Claim 6 was for "Use of (a) a monoclonal antibody and (b) an anti-neoplastic agent, as defined in any one of claims 1 to 5, for the preparation of a therapeutic composition for treating cancer". The chosen monoclonal antibody was cetuximab (Erbitux) and the chosen anti-neoplastic agent was irinotecan. 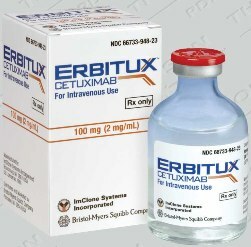 The European Commission granted market authorisation for use of the patent in June 2004, the authorisation being stated to be for "the medicinal product "Erbitux – cetuximab". The clinical particulars described the product so authorised as 'Erbitux in combination with irinotecan ... for the treatment of patients with...(EGFR) expressing metastatic colorectal cancer...". Relying on the Commission's authorisation Yeda made two SPC applications (the 037 and 038 applications). The 037 application specified the product to be protected as "cetuximab in combination with irinotecan". Lawrence Cullen refused to grant the SPC on the basis that, since the authorisation was for cetuximab alone, the application did not comply with Article 3(b) of Regulation 1768/92 since the SPC was not for the product for which authorisation was granted. The 038 application specified the product to be protected as "cetuximab". Lawrence Cullen rejected this application too, since cetuximab alone was not the invention protected by the patent with art 3(a), which requires that the product be protected by the patent. Yeda appealed in respect of both refusals. The really interesting bit related to the 038 application. Here Yeda argued that, since a combination of cetuximab and irinotecan was needed in order to make up the "therapeutic composition" claimed by Claim 6, the combination would take place inside the patient's bloodstream. Accordingly, if someone supplied cetuximab with the intention that it would be administered to a patient, that supply would be a supply of a means for putting the invention into effect. It would be obvious to the supplier of the cetuximab that it was intended to put the invention into effect -- which would amount to secondary infringement under the Patents Act 1977, s.60(2). Under European case law, whether a product is protected by a basic patent in force is a question of domestic law. Cetuximab was therefore protected by the basic patent in force. On behalf of the Comptroller of Patents it was argued that, if Yeda had to rely on the making of the therapeutic composition inside the body of the patient during the course of treatment, it was actually claiming a method of treatment which was barred from being patented under section 4A(1) of the 1977 Act. Discussion arose in the course of proceedings as to whether it was appropriate or necessary for the court to refer a series of questions to the Court of Justice of the European Union for a preliminary ruling. * What constitutes a "product" must be strictly construed, looking at what it is, rather than what it does, and taking into account only its active ingredients. * The Commission's authorisation decision clearly identified the medicinal product, 'Erbitux – cetuximab' as its subject-matter -- no other medicinal product was identified. It alluded to irinotecan only in order to explain how cetuximab was used. This could not constitute a marketing authorisation of a product consisting of both cetuximab and irinotecan. * Given the restrictive interpretation of the term "product", to incorporate the notion of secondary infringement into the SPC regime would be illegitimate. While this was not acte clair, it was in any event a matter for national rather than European law, so no reference would be made for a preliminary ruling from the Court of Justice of the European Union.